From the expert craftsmen at Sinkology, this vessel sink combines timeless style and modern efficiency into an elegant unit. Constructed out of sturdy copper, it maintains a stylish look through all kinds of everyday wear and tear. Improve the overall look and utility of any bathroom during your next home renovation project with this sink. This sink is crafted with timeless style and top-notch efficiency. Made by Kraus, it spruces up the look of any bathroom. Manufactured using high quality glass, it can withstand all kinds of everyday wear without losing its stylish appearance. Next time you take on a home renovation project, make sure to choose this top-notch sink. From the expert craftsmen at Kraus, this vessel sink combines timeless style and modern efficiency into an elegant unit. Manufactured using high quality glass, it can withstand all kinds of everyday wear without losing its stylish appearance. You'll be glad you chose this top-grade sink for your next home improvement project. Time to upgrade the look of your bathroom? This elegant, durable sink from Kraus is just what you need. Made from glass, this sink is both wear resistant and stylish. You'll be glad you chose this top-grade sink for your next home improvement project. Stylish and extra durable by design, this vessel sink from Sinkology is sure to be a staple of your bathroom remodel. It's been designed with ultra-durable copper, capable of keeping its beautiful appearance even after years of wear and tear. When your bathroom needs a new look, start fresh with this top-of-the-line sink. Eddington 16-inch x 6-inch x 16-inch Circular Copper Bathroom Sink with Drain in Bronze From the expert craftsmen at Sinkology, this vessel sink combines timeless style and modern efficiency into an elegant unit. Constructed out of sturdy copper, it maintains a stylish look through all kinds of everyday wear and tear. Improve the overall look and utility of any bathroom during your next home renovation project with this sink. 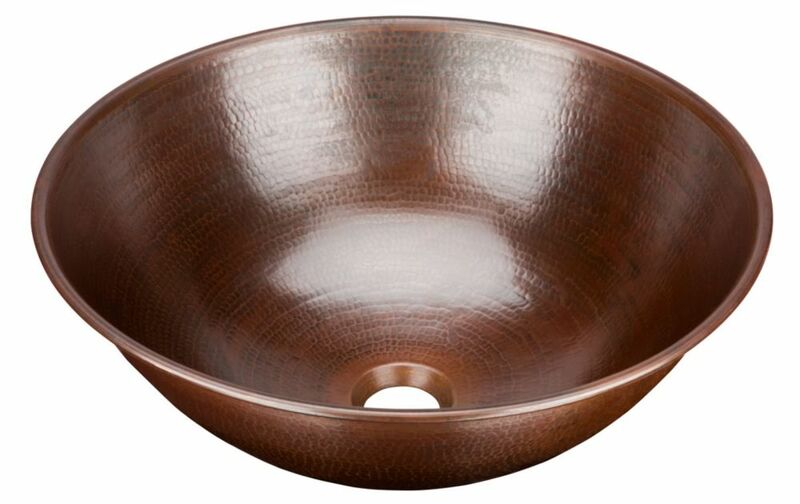 Eddington 16-inch x 6-inch x 16-inch Circular Copper Bathroom Sink with Drain in Bronze is rated 4.6 out of 5 by 14. Rated 5 out of 5 by Leah from Amazing sink. Looks great.... Amazing sink. Looks great. Rated 3 out of 5 by Anonymous from Don't use hard water cleaner! I bought 2 of these. Although I love the sinks, I just used hard water cleaner and the finish came off in seconds! Rated 4 out of 5 by mom from Very nice - but darker I like it, but the copper color is a little darker than I expected. Rated 4 out of 5 by Meridian from Great Sink, But Not a Standard Mount I love this sink. It is good quality and I love the look. One thing to look out for though, if you are putting the sink on a marble, granite or another hard surface that needs drilling, the sink does not work in a standard sized hole. It takes a 2 5/8" hole for the sink to sit correctly on the counter top. I had to have my granite re-drilled upon receiving the sink. The dimension drawing from Ecosinks never shows this detail. It was frustrating to have to have my top re-drilled, but I love the sink. Just be aware of this. I wish I had been. Rated 5 out of 5 by Bill from Great product at great price Superb value, we had been looking for something like this and saw prices literally 10x as high. Rated 4 out of 5 by Anonymous from excellent value Have not installed them yet but they are unique and were an excellent price. I had looked at local stores and was unable to find anything other than the "normal" vessel sink. This sink is a no-overflow vessel (above the counter) sink so we recommend using a grid drain like the Sinkology model # TG01-AG that can be purchased separately. If you prefer to buy an all-in-one kit that includes a grid drain you can find this in Sinkology Model # BRV-1606BC-F040 which is Home Depot online SKU # 300879488. For sinks with an overflow where a pop-up drain is recommended, Sinkology has our model # TP01-AG which is Home Depot online Internet #304598406 / Home Depot Store SKU #1003016956.